The often great differences in emission from different objects are very visible in this sector. Sh 2-211 and Sh 2-212 are most prominent at microwave frequencies. Sh 2-213 appears to be a very faint Stromgren sphere around a B4 class star in the cluster Berkeley 11. There is no visible emission around either Sh 2-213 or Sh 2-214 on any of the frequency maps. 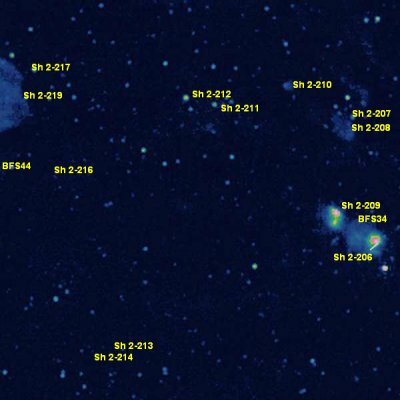 There is, remarkably, nothing significant in the scientific literature on the HII region Sh 2-210, despite its large size in hydrogen-alpha and visibility (albeit on a much smaller scale) at radio and infrared frequencies as well. Russeil ventures a distance estimate of 2200 parsecs , which would give this mysterious nebula in the direction of the constellation Camelopardalis a diameter of 12.8 parsecs. 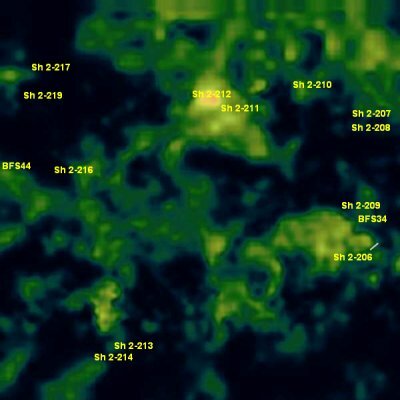 Sh 2-210 lies behind the far eastern end of Cam OB1, the largest OB association, which stretches 17 degrees in longitude from 151° all the way to 134°. Sh 2-206 and Sh 2-209 are most prominent at radio frequencies. Cam OB1 and the related Camelopardalis molecular cloud complex, lie at a distance of 800 to 1000 parsecs. They mark the outer boundary of our local galactic region, the Orion spur, just as similar molecular clouds in Auriga, Gemini, Monoceros and Canis Majoris mark this boundary east of the Auriga gap. Sh 2-206 (NGC 1491) is an older, evolved HII region ionised by the O5 star BD +50 886  and bright at hydrogen-alpha, radio and infrared frequencies. You can see a good image of this nebula in visible light here which shows the bubble formed around the central star. 11. ^ Omar, A., Chengalur, J. N., & Roshi, D. A. 2002, Bulletin of the Astronomical Society of India, The electron temperatures of HII regions S 201, S 206 and S 209: multi-frequency GMRT observations.